I apologize for the newbie question..... I am have one of my new heads on the bench and am setting up to check the geometry on my rockers to see if I need to adjust the pedestal height. Here is the question; my cam card says Intake lobe lift is .468 and valve lift is .809. So am I correcting in setting the dial indicator up on the retainer at .809 and roll the rocker until the dial indicates 0? 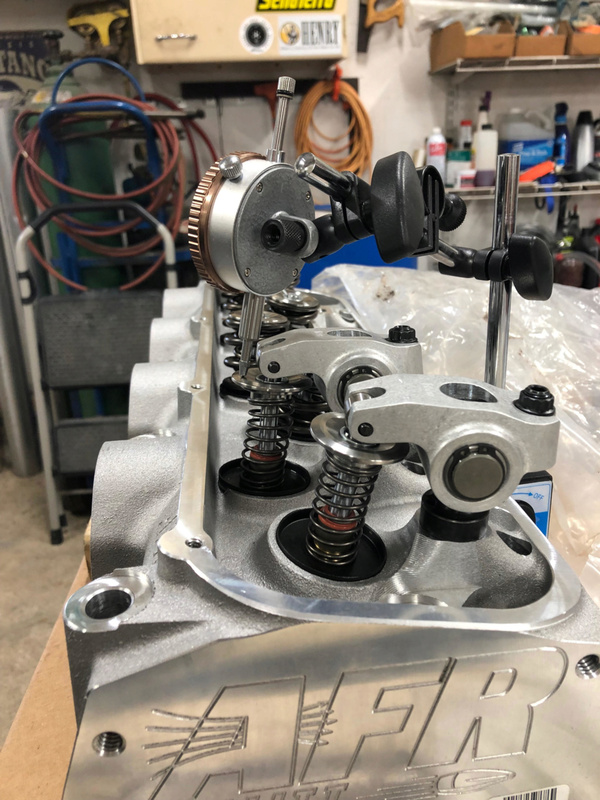 The valve lift listed is merely "Theoretical" valve lift as is only true IF the rocker arm provides the exact ratio as it is listed to do AND the pushrod is exactly straight and parallel to the lifter. LOBE lift can be measured at the lifter or the pushrod if it is exactly parallel to the lifter ... which it is not, in the case of a big block Ford engine. Thanks for the information. I won't touch the pedestals until I get the block back from the machine shop. But is my set up right to get a general idea of the roller contact pattern on the valve tip? HorsinAround wrote: Thanks for the information. I won't touch the pedestals until I get the block back from the machine shop. But is my set up right to get a general idea of the roller contact pattern on the valve tip? Contact pattern is not a good way to determine correct geometry on a big block Ford engine ... but, it should get you close.